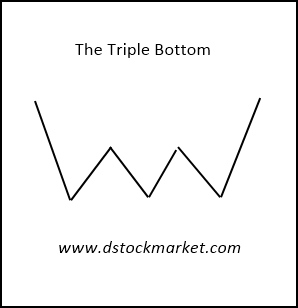 The triple bottom is a bullish reversal pattern that often appears at the bottom of a move. Stock can reverse the downtrend and move higher after the appearance of this pattern. 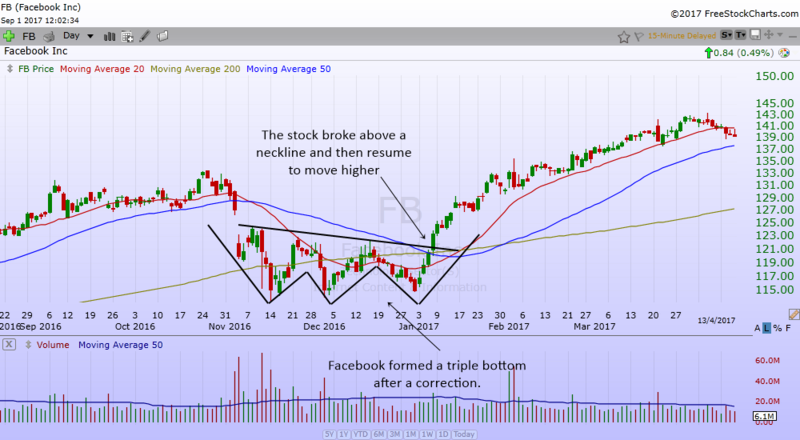 This chart pattern is quite rare because most stocks will form a double bottom and then move higher. Double bottoms are more common in most stocks. It is once in a while that you will be able to see the triple bottom. The diagram above shows how a triple bottom pattern looks like. It is not difficult to spot this pattern in stock charts. The stock will make three lows which are almost at the same price. After the 3rd low, the stock will move higher. This chart pattern often appears when a stock is bottoming. It can also happen after a correction. The chart above is what a real life triple bottoms looks like in a stock chart. Facebook had a correction from November 2016 to January 2017. It made 3 lows which are at almost the same price. Then the stock rose higher. Sometimes you can connect the rally highs and form a neckline. When the stock breaks above the trendline, it tells the trader that the stock is starting a new uptrend. There are 2 ways to trade the triple bottom. An aggressive way and a conservative way. The aggressive way is to buy the stock as it forms a 3rd low. This is usually accompanied by an oversold indicator signal such as the stochastics. In the chart above, the aggressive trader might buy Facebook as it forms the 3rd low and when the stochastics indicator gets oversold and produces a buy signal. The trader might put the stop loss at the low of the 3rd bottom or at the lowest point of the three bottoms. 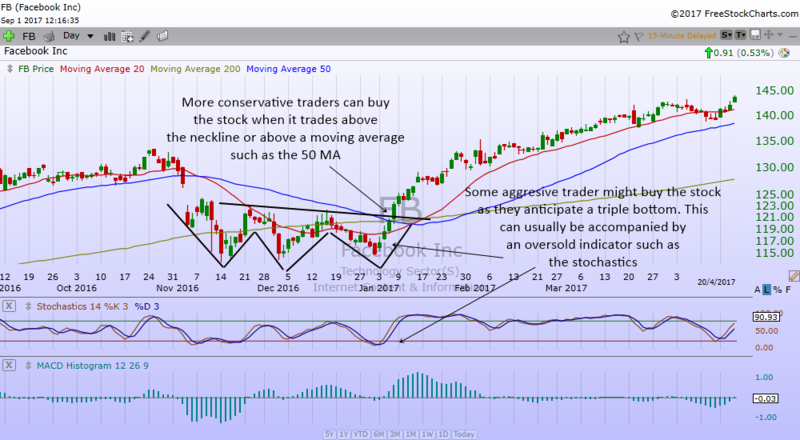 For a more conservative approach, the trader might buy the stock as is breaks above the neckline trendline. The trader might also buy the stock when it trades above a moving average such as the 50 day moving average. To have an initial target for the stock, the trader can take the height of the neckline to the low of the pattern. Then project it upwards for a 1st target. Many times, a stock can go higher than the first target. Especially if the stock starts a new uptrend. A picture is certainly worth a thousand words. 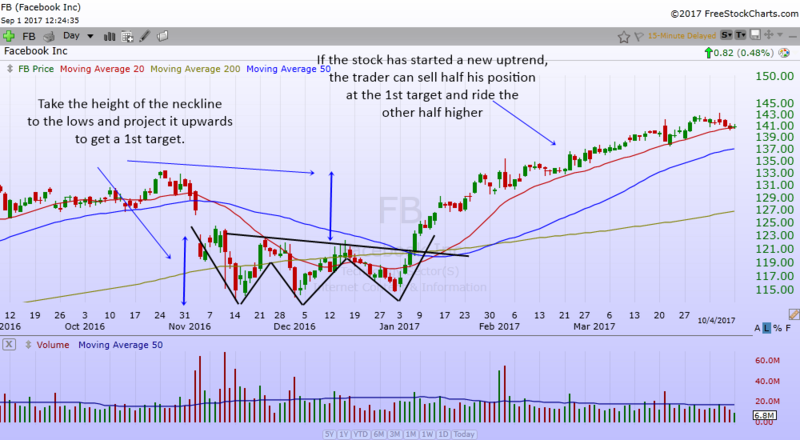 Looking at the chart of Facebook above, the trader can take the height of the neckline to the lows and project it upwards to get a 1st target of around 133. If the trader thinks that the stock has started a new uptrend, he or she can sell half of the position to lock in some profits. The remaining half, they can ride the stock higher to have more gains.